Antoni Matilla: The highly heterogeneous Spinocerebellar Ataxias: From genes to targets for therapeutic intervention. Euro-Ataxia, Newsletter, Dec. 2003. Holm Graessner, Olaf Riess: EUROSCA. Europäisches Großproject zur Erforschung von Ataxien startet. Medizinische Genetik, März 2004. Schöls L, Bauer P, Schmidt T, Schulte T, Riess O. Autosomal dominant cerebellar ataxias: clinical features, genetics, and pathogenesis. Lancet Neurol. 2004 May;3(5):291-304. Review. A.Matilla and M.Radrizzani. The Anp32 family of proteins containing Leucine-rich repeats (LRRs). Cerebellum 4 (1), 7-18 (2005). ataxin-3: Structural determinants for molecular recognition. Proc Natl Acad Sci U S A. 2005 Jul 14; [Epub ahead of print]. T. Schmitz-Huebsch et .al. Scale for the Assessment and Rating of Ataxia. Development and Validation of a new ataxia scale. 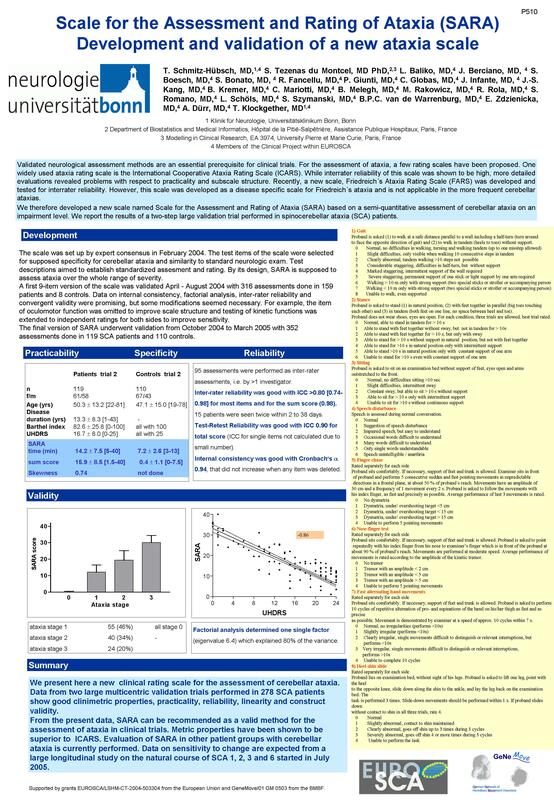 Poster presented at meeting of German Society of Neurology in wiesbaden 2005. Schmitz-Hübsch T, Tezenas du Montcel S, Baliko L, Boesch S, Bonato S, Fancellu R, Globas C, Kang J, Kremer B, Mariotti C, Rakowicz M, Rola R, Romano S, Schöls L, Szymanski S, van de Warrenburg BPC, Zdzienicka E, Dürr A, Klockgether T. Reliability and validity of the International Cooperative Ataxia Rating Scale (ICARS): A study in 156 spinocerebellar ataxia (SCA) patients. Mov Disorders (in press). Schmitz-Hübsch T, Tezenas du Montcel S, Baliko L, Berciano J, Boesch S, Depondt C, Fancellu R, Giunti P, Globas C, Infante J, Kang J-S, Kremer B, Mariotti C, Melegh B, Pandolfo M, Rakowicz M, Ribai P, Rola R, Schöls L, Szymanski S, van de Warrenburg BPC, Dürr A, Klockgether T. Scale for the Assessment and Rating of Ataxia (SARA): Development of a new clinical scale. Neurology (positively reviewed). Cagnoli C, Mariotti C, Taroni F, Seri M, Brussino A, Michielotto C, Grisoli M, Di Bella D, Migone N, Gellera C, Di Donato S, Brusco A. SCA28, a novel form of autosomal dominant cerebellar ataxia on chromosome 18p11.22-q11.2. Brain. 2006,129:235-42. Epub 2005 Oct 26. Pandolfo M, Van de Warrenburg BPC. Spinocerebellar ataxia type 14: opening new doors in ataxia research. Neurology 2005;64:1113-1114. Stevanin G, Durr A, Benammar N, Brice A. Spinocerebellar ataxia with mental retardation (SCA13). The Cerebellum 2005, 4 :43-46. Waters M, Minassian N, Stevanin G, Figueroa K, Nolte D, Bannister J, Mock A, Evidente V, Fee D, Muller U, Durr A, Brice A, Papazian D, Pulst S. Mutations in voltage-gated potassium channel KCNC3 cause degenerative and developmental central nervous system phenotypes. Nat Genet. 2006 Apr;38(4):447-451. Stevanin G, Broussolle E, Streichenberger N, Kopp N, Brice A, Durr A. Spinocerebellar ataxia with sensory neuropathy (SCA25). The Cerebellum 2005, 4 :58-61. Klebe S, Durr A, Rentschler A, Hahn-Barma V, Abele M, Bouslam N, Schöls L, Jedynak P, Forlani S, Dussert C, Agid Y, Bauer P, Globas C, Wüllner U, Brice A, Riess O, Stevanin G. New mutations of Protein Kinase Cγ associated with Spinocerebellar Ataxia Type 14 (SCA14). Ann Neurol 2005; 58:720-729. B.P.C. van de Warrenburg, H. Hendriks, A. Dürr, M.C.A. van Zuijlen, G. Stevanin, A. Camuzat, R.J. Sinke, A. Brice, H.P.H. Kremer. Age at onset variance analysis in spinocerebellar ataxias: a study in a large Dutch-French cohort. Ann Neurol. 2005 Apr;57(4):505-12. Albrecht M, Golatta M, Wüllner U, Lengauer T (2004): Structural and Functional Analysis of Ataxin-2 and Ataxin-3. European Journal of Biochemistry, 271, 3155-3170. Latouche M, Fragner P, Martin E, El Hachimi KH, Zander C, Sittler A, Ruberg M, Brice A, Stevanin G. A Polyglutamine and polyalanine expansions in ataxin 7 result in different types of aggregation and levels of toxicity. Mol Cell Neurosci 2006, In press. Latouche M*, Lasbleiz C*, Martin E, Monnier V, Debeir T, Prigent A, Muriel MP, Brice A, Stevanin G, Tricoire H. Late onset degeneration of the nervous system, reversible neuronal specific impairments and identification of modifier genes in a Drosophila inducible model of a polyglutamine disease, SCA7. Submitted. * equal contributions. Janer A., Martin E., Muriel MP., Latouche M., Fujigasaki H., Brice A., Trottier Y. and Sittler A. PML clastosome bodies prevent the aberrant nuclear accumulation of mutant ataxin-7 and other polyglutamine proteins. Submitted. S Sarkar, RA Floto, Z Berger, S Imarisio, A Cordenier, M Pasco, LJ Cook and DC Rubinsztein. Lithium induces autophagy by inhibiting inositol monophosphatase. Journal of Cell Biology (2005) 170: 1101-1111. DC Rubinsztein, B Ravikumar, A Acevedo-Arozena, S Imarisio, CJO’Kane, and SDM Brown. Dyneins, autophagy, aggregation and neurodegeneration. Autophagy (2005) 1: 177-178. Z Berger, B Ravikumar, FM. Menzies, L Garcia Oroz, BR Underwood, MN Pangalos, I Schmitt, U Wullner, BO Evert, CJ O’Kane, and DC Rubinsztein. Rapamycin alleviates toxicity of different aggregate-prone proteins. Human Molecular Genetics (In Press). Luis Velazquez-Perez, Carola Seifried, Michael Abele, Florentina Wirjatijasa, Nieves Santos-Falcon, Edilberto Martinez-Gongora, Gilberto Sanchez-Cruz, Luis Almaguer-Mederos, Rafael Carralero, Nalia Canales-Ochoa, Michael Fetter, Ulf Ziemann, Thomas Klockgether, Georg Auburger. Saccade velocity reduced in presymptomatic Spinocerebellar Ataxia type 2 (SCA2). Submitted. Inka Tuin, Ursula Voss, Jun-Suk Kang, Kirn Kessler, Christian Menzel, Dagmar Nolte, Hans Lochmüller, Sigrid Tinschert, Detlef Claus, Thomas Klockgether, Helmuth Steinmetz, Georg Auburger. Polysomnographic findings in hereditary spinocerebellar ataxia type 2 (SCA2). Submitted. Helmlinger D, Hardy S, Abou-Sleymane G, Eberlin A, Bowman AB, Gansmuller A, Picaud S, Zoghbi HY, Trottier Y, Tora L, & Devys D. Polyglutamine-expanded Ataxin-7 mediates aberrant recruitment of TFTC-type complexes and chromatin decondensation leading to photoreceptor dysfunction in Spinocerebellar ataxia type 7. PLoS Biology, (in press). Nicastro, G., Menon, R., Masino, L., McDonalds, N.O., Pastore, A. (2005) The solution structure of the Josephin domain of ataxin-3: Structural determinants for molecular recognition. PNAS 102, 10493-10498.
de Chiara, C., Menon, R.P., Dal Piaz, F., Calder, L., Pastore, A. Polyglutamine is not all: The functional role of the AXH domain in the ataxin-1 protein. Journal Molecular Biology 354, 883-893 (2005). de Chiara, C., Menon, R.P., Adinolfi, S., de Boer, J., Ktistaki, E., Kelly, G., Calder, L., Kioussis, D. and Pastore, A. The AXH domain adopts alternative folds the solution structure of HBP1 AXH. Structure (Camb) 13, 743-753 (2005). A.Matilla, R.Goold, P.Giunti. Molecular pathogenesis of spinocerebellar ataxias. Brain. 2006 Apr 13; [Epub ahead of print]. R.V.Costanzo, G.J.Vilá-Ortíz, C.Perandones, H.Carminatti, A.Matilla, M.Radrizzani. Anp32e/Cpd1 regulates protein phosphatase 2A activity at synapses during synaptogenesis. European Journal of Neuroscience, in press (2006).